If you visit the Rijksmuseum in Amsterdam you are served a very special kind of biscuit with your tea: an ‘Eberhardje’. The ‘father of Amsterdam’, Eberhard van der Laan, mayor between 2010 and 2017, lent the biscuit its name. Its heart-like shape is more than a pun on Van der Laan’s first name (‘-hard’ sounding as ‘hart’, which means ‘heart’ in English). It refers to his reputation of being a caring and loving mayor who encouraged his fellow citizens on his death bed to “take care of our city and of each other”. From the beginning of his mayoralty Van der Laan consistently spoke of Amsterdam as a “sweet city” and of her citizens as “sweet Amsterdammers”. This type of familial language was taken over by the citizens themselves, who organised a huge honorary meeting under the window of the official residence of their dying mayor. An enormous applause under the motto ‘for Eber <3’ echoed against the houses at the Herengracht. An ‘Eberhardje’; the three saltires (the St Andrew’s Cross) also figure in the Amsterdam coat of arms. by: Jim Forest, Flickr. Although it has a funny aspect, the biscuit plays a tremendously important role in the commemoration of the former Amsterdam mayor. 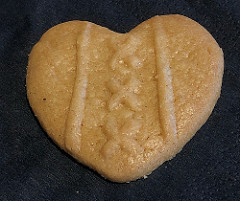 Van der Laan’s political programme, which promoted the love for Amsterdam and her people, is continued by the production and selling of a cookie that symbolizes his message. More specifically, with this ‘Eberhardje’ the name Eberhard has come to stand for the message of civic love and support. It does not stop with the biscuit. Van der Laan received posthumously a traditional ‘burgermeesterfleschje’ (a mayor’s flask) which placed him in a long line of mayors of Amsterdam since 1592; there exists a special ‘Eberhard scarf’, the profits of which go to cancer research; and a permanent monument will be erected this year in his honour – last month it was announced that artist collective Kamp Seedorf is going to design it. Damsko Strijder, the art monument in honour of Eberhard van der Laan, painted by Kamp Seedorf. How is it possible that this single man became such a central figure in the history of Amsterdam and even of the Netherlands? In the media, this ‘mayor of the Netherlands’ was seen to turn into a yardstick for all other Dutch mayors. There were of course many different factors contributing to Eberhard’s transformation into the iconic ‘Eber <3’. His portrayal in the media is one, but his remarkable personal history (his parents were both members of the Dutch resistance during WO II) or his long-standing involvement in politics as a member of the PvdA (Dutch Labour Party) also offered interesting material for the creation of a national icon. However, great part of Van der Laan’s success lies in his self-promotion, and his active cultivation of the role of a ‘father’. 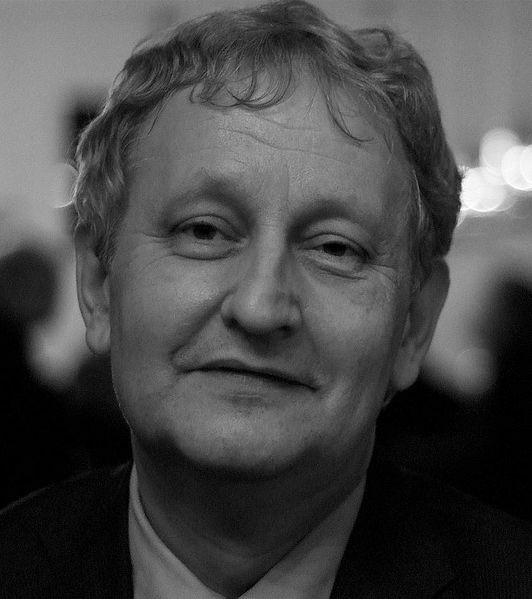 Eberhard van der Laan (1955-2017), by: Patrick Ravensbergen. First, what do the terms ‘mayor’ and ‘burgemeester’, with its synonym ‘burgervader’, in Dutch mean? Both are derived from Latin counterparts. ‘Mayor’, according to Oxford Dictionaries, is a derivation of the Latin maior, meaning ‘the greater’, or ‘elder’. The word ‘burgemeester’ in Dutch means, according to Van Dale, ‘the first citizen’ – more literally ‘master of all citizens’. ‘Burgervader’ expresses this idea a bit more strongly: ’vader’ is derived from Latin pater, and the patres (plural) were the most prominent members of society, the ‘elders’. Within a patriarchal society the (male) patres and maiores are those in power, the political actors and the ones who set precedents for the future. But the father image could be stretched further. In Roman times, one could be proclaimed pater patriae, father of the country, in the event of a military triumph or the prevention of civil conflict. Since Augustus the Roman emperors were generally considered – or considered themselves – the ultimate protectors of Rome and received the title almost by convention. Before the imperial age, one of the earliest men to lay claim on the title was Marcus Tullius Cicero. On the last day of his consulship, the highest position in Roman politics, the effect of his image as a father of the country proved a big one. He says: “the entire people of Rome accorded to me, not a vote of thanks which would pass with the day, but eternity and immortality, when, themselves upon oath, with one voice and one heart, they acclaimed an oath so proud and so memorable” (Against Piso 6; transl. N. Watts). Cicero presents himself as leader and caretaker of the people, who have opened their hearts to him by swearing on oath that he is their saviour. The rhetorical image of the entire people embracing and glorifying him, and, in turn, the portrayal of himself as guardian of the city and her citizens, is frequent in Cicero’s speeches. He made it part of his political programme that the Roman citizens were constantly reminded of Cicero’s symbolical post as ‘father of the country’. 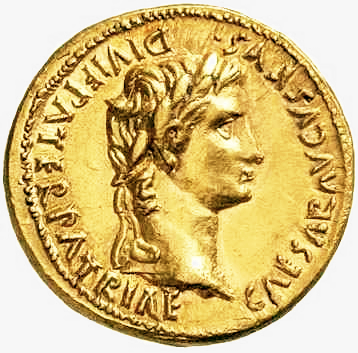 An aureus (gold coin) from 13-14 AD celebrating emperor Augustus as pater patriae, by: CNG. The age-old commonplace of the fatherly leader looking after his citizens, and the reciprocal bond between both parties is easily identified in the political conduct of Van der Laan. Comparison with the Roman orator Cicero teaches us how effective and clever it is. Van der Laan presented himself as a guardian and father by calling the people of Amsterdam sweethearts, and admonishing them to take over his role after he died. Being a ‘burgervader’ the care for the citizens of Amsterdam was a normal feature of his job: he was the primary person responsible of the citizens. Yet he chose to develop the fatherly attitude actively and publicly, sometimes severe, often gentle. As the stories go, he could listen for hours to the story of a Jewish family, but just as easily he would rebuke an unreasonable fellow citizen. The mayor’s fellow citizens absorbed his message of familial love and projected it back onto his commemoration. This completes the circle; Van der Laan’s aim to make Amsterdam more harmonious, more responsible and ‘sweeter’ has been fulfilled. The immediate, visible and lasting success of ‘Eber <3’s’ paternal policy is surely a major reason why the whole of the Netherlands sung his praise. A. Alföldy, Der Vater des Vaterlandes im römischen Denken (Darmstadt: Wissenschaftliche Buchgesellschaft, 1971). K. Rijken, Van der Laan. Biografie van een burgemeester (Amsterdam: Ambo Anthos, 2018). B. Tooms, ‘Lieve man, een vriend, een bewogen politicus’, Nrc.nl, 06-10-2017 [last access. 05-02-2019]. ‘Eberhard van der Laan, Popular Mayer of Amsterdam, dies at 62’, NY Times, 06-10-2017 [last access. 05-02-2019].